A new year brings optimism. And there is good reason to be positive about the increasing options for people needing to replace their heart valves. Transcatheter aortic valve replacement (TAVR) is a viable option for those with severe aortic valve stenosis who are at high and intermediate risk for open-heart surgery. Northwell Health has implanted more than 2,000 of these valves via a minimally invasive procedure and will likely begin offering TAVR commercially to lower risk populations in 2019, thanks to positive results from ongoing studies. Also, those suffering from mitral valve regurgitation now have a options, including ongoing clinical trials at Lenox Hill, Southside and North Shore University Hospitals. Aortic valve stenosis occurs when one or more of the leaflets in the valve becomes calcified, causing the opening of the valve to narrow. When the aortic valve is unable to open fully, the amount of blood flow to the body is significantly reduced and can lead to shortness of breath, chest pain, dizziness, loss of consciousness or even death. Historically, open-heart surgery was performed to replace the aortic valve but since 2011, TAVR has been available as an alternative. With significant advancements in the technology, newer versions of the TAVR valves are available. They include features that have been incorporated to improve patient outcomes. Currently, the newest, third-generation TAVR valves being used are smaller in delivery size to allow for easier delivery into the body and are fitted with an extra outer-lining to provide better sealing with a patient’s native valve, reducing the amount of potential leakage around the valve. The smaller delivery size has expanded our access to the heart such that more than 95 percent of patients have the valve inserted through the femoral artery in the groin. Overall, these valves have led to lower rates of mortality and stroke. Given the excellent outcomes with the newest generation of valves, Lenox Hill uses a minimally invasive approach to TAVR. The majority of patients have the procedure performed under conscious sedation, eliminating the need for general anesthesia. Many do not need invasive arterial lines for monitoring, which translates into limited or no ICU time. Typically, patients are discharged home within a day or two after valve implantation. To reduce the incidence of stroke during TAVR, an embolic protection device is used in select patients. The device is placed through an artery in the arm and contains two filters that protect the circulation to the brain during the procedure and removed at the end of the procedure. To date, TAVR has been approved for use in those considered intermediate- or high-risk for open-heart surgery or in people who are not operative candidates. 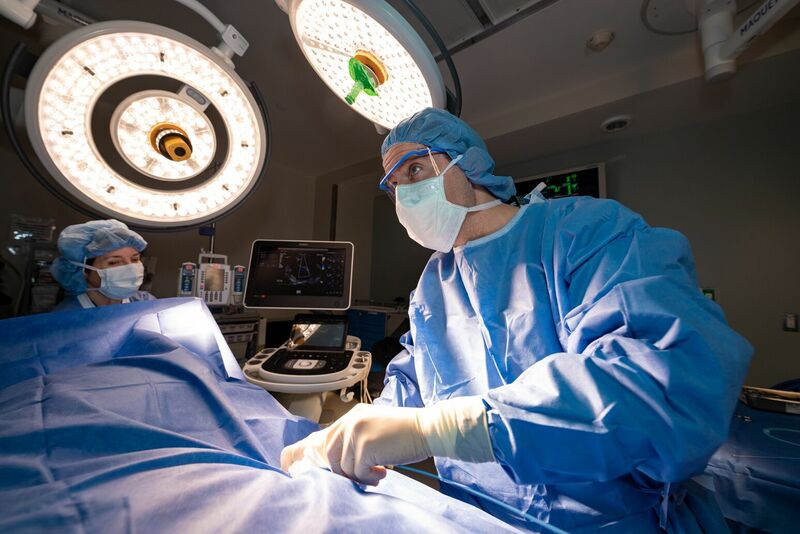 There are two large clinical trials in the US looking at safety and efficacy of TAVR in the low-risk population, where the typical mortality risk of a surgical aortic valve replacement is less than three percent. Northwell is a participant in this low-risk TAVR trial. While those results are still pending and expected to be presented at the American College of Cardiology conference in New Orleans this March, there have been smaller clinical trials in both Europe and the US that have shown equal benefits for younger and healthier patients who are considered low-risk for open-heart surgery. If these large randomized trials are positive, it will expand TAVR to all patient populations, irrespective of risk. In addition to using TAVR for aortic stenosis, there is good news for dealing with other heart valve conditions as well. Mitral regurgitation is the most common valvular heart disease in the US, with about 200,000 new cases diagnosed each year. The leaky valve causes blood to flow backward in the heart. In severe cases, the condition is debilitating and progressive and can lead to heart failure and death if left untreated. While open heart surgery to repair or replace the mitral valve is considered the gold standard therapy, many patients are deemed too high risk for surgery. Medical therapy alone does not work well for many patients and 50 percent die within five years with 90 percent being readmitted multiple times for heart failure. There are limited transcatheter options to offer patients who cannot undergo open heart surgery. To remedy this, Northwell is participating in Abbott’s Tendyne transcatheter mitral valve replacement (TMVR) clinical trial. During the procedure, a small incision is made in the left chest through which a catheter is inserted to place a new mitral valve. The valve can be fully retrieved and repositioned to allow for ideal placement and improved outcomes. Northwell is also participating in Medtronic’s Intrepid TMVR clinical trial, in addition to two other clinical trials that use novel transcatheter technologies to repair the mitral valve – Edward’s PASCAL and Cardioband devices. In early studies, TMVR has greatly impacted patient quality of life and is considered a game-changer within the field. Southside Hospital implanted the first Tendyne TMVR valve in New York State and Lenox Hill was the first in Manhattan to implant the valve. Chad Kliger MD, specializes in interventional cardiology and cardiology. 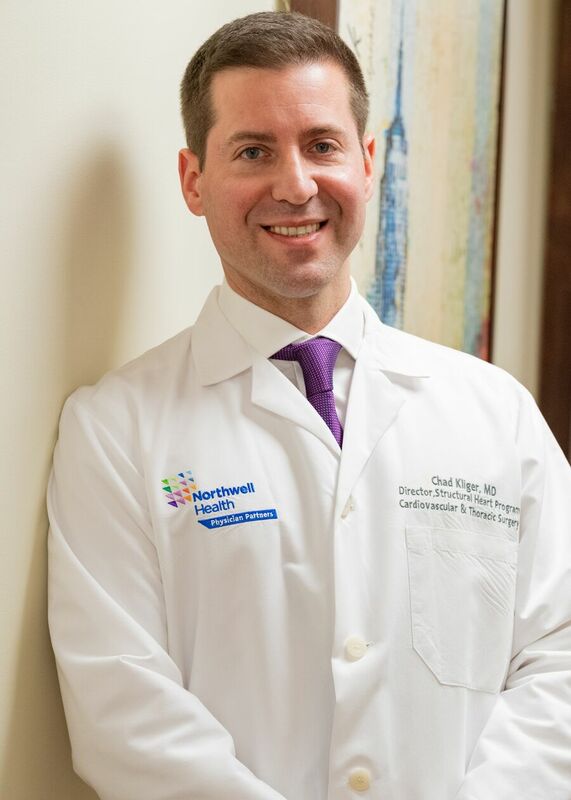 He is the Director of Structural Heart Disease at Lenox Hill Hospital/Western Region Northwell Health and an assistant professor of cardiovascular medicine at the Donald and Barbara Zucker School of Medicine at Hofstra/Northwell. Alicia Adams, PA-C, is the program coordinator for structural heart disease at Lenox Hill Hospital. Lenox Hill Heart & Lung specialists offer advanced cardiac programs in areas including, interventional cardiology, electrophysiology, heart failure, structural heart disease, women’s heart health and heart disease prevention.